Spain is a country of passion, life, colour and contrasts and nothing represents this quite like the Spanish tapas and the ritual of enjoying them. 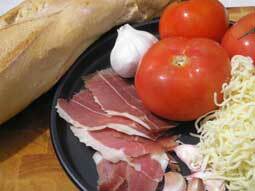 Tapas are a true celebration of the Spanish culture and social way of life for which the Spanish are famous. Tapas are in effect bite sized morsels of food served with a drink in the bar and the Andalucian region of Granada is the only place where tapas are still complimentary. The word 'tapa' means cover and this is one of the historical explanations of their origin, when bar or tavern owners used to place a small piece of bread over their patrons glass to keep the flies out. Other early 'tapas' were pieces of spicy Spanish chorizo or slices of cured Serrano ham and as these are a bit salty, customers had to order another drink to quench their thirst, so the tapa was a good business idea as well as a delightful treat for customers. Another popular theory behind the origin of the tapa is that travelers on their way through town or villages would stop at the local inn or tavern and be served a drink and a bite to eat at the entrance whilst still on their horse or in their carriage as there was no time to enter the premises for a full meal. This small offering was enough to see them through during the next leg of their journey. There is actually no written record of the origin of the Spanish tapa, but the concept has blossomed from serving the simplest slice of bread or 'jamon' to a gastronomical delight and social institution. Tapas represent, in modern times, the warmth and openness of the social Spanish lifestyle - there is nothing quite like a drink and a chat with some friends and some delicious tiny nibbles to enhance the experience. The Spanish phrase, 'ir de tapas' means going from bar to bar or 'tasca' as a tapas bar is known, having a drink with friends or family after work and of course, sampling the array of dishes on offer. From the thinly populated pueblos of Andalucia to the largest modern cities, tapas bars and the tapas culture are an important part of the Spanish lifestyle. The reputation of a bar is based on the quality of their tapas as the tapa is the most important aspect of these social gatherings. 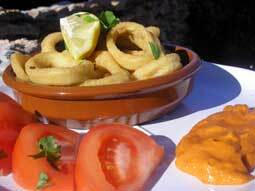 You can often find up to ten different tapas dishes ready prepared to be served and you will never get the same dish twice. Usually you order your drink and then the tapa will arrive shortly afterwards, but in the Basque country there are bars with the tapas dishes already laid out on the bar and you can go along sampling a little bit here and a little bit there! Often people will enjoy a drink and tapa at the bar before moving to their table for a meal or they will simply spend the evening moving from once place to another enjoying tapas en route. You can have a full meal just by trying out the tapas in three or four places. The key to the Spanish tapa is their size, they must be small as some are served complimentary or included in the price of an alcoholic drink. The whole point of them really is to accompany a drink and satisfy the customer. Tapas, although small are often mini tasters of the menu of the day anything from small pieces of marinated chicken to tiny paella portions, you can sample some of the finest local cuisine just by enjoying a tapa. Of course tapas can also be some local cheese and olives or a few slices of Serrano ham with almonds but they are always beautifully presented and encompass the finest examples of traditional local dishes. Some popular tapas dishes include: Serrano ham with melon, Manchego cheese and almonds, gambas al pil-pil, cheese and ham croquettes, meatballs, anchovies in vinegar tortilla de patatas.